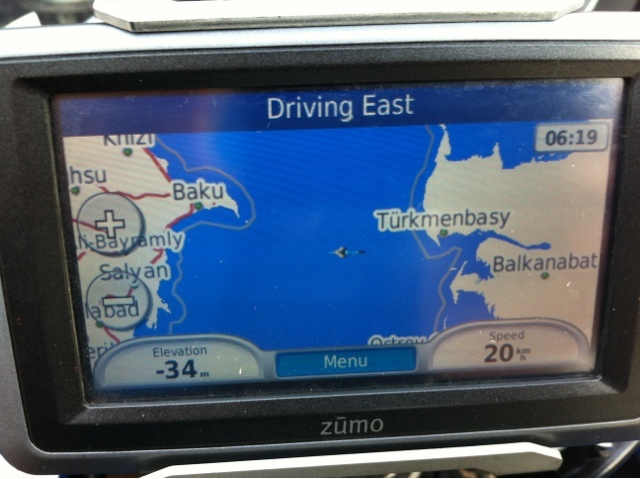 Breaking news last night was that there was a boat leaving Baku for Turkmenbashi the next day. We were expecting to spend a day or so in the capital of Azerbaijan while our local guides found us passage but we had been lucky. So instead of a leisurely ride and some sightseeing, we were off! An early morning ride through the lush, green, cool forests and down into the smog and traffic of the city which has become the oil capital of the Caspian Sea. To the hotel for a quick change into seagoing gear. Blazers and deck shoes for Gentlemen. Cocktail gowns for the ladies. Riding gear in the van and off to the docks. It took 2 hours to clear passports and customs (Tip: Do Not Lose The Scrap Of Paper With The Bar Code On It). Then onto the cargo ferry. Actually not as bad as the previous trip's video showed. Quite habitable if stuffy. The cook made us a decent meal and didn't want any of the supplies the group bought in Baku in preparation. The wine came in handy though. Soon Steve L had his guitar out and sang his latest hit, "Globebuster Blues". This boy can play and he was soon re-christened - meet Stevie Love. Sam kept beat on drums (Ortleib bags make good skins) and Tin Tin revealed his talent for sing along songs. Not sure what the local truck drivers made of it but they joined in with some of their own. The boat sailed at 11:00 on a calm sea and a warm night, so many of us slept on deck rather than in the stuffy cabins. The GPS shows the bike's current location. Note the altitude.